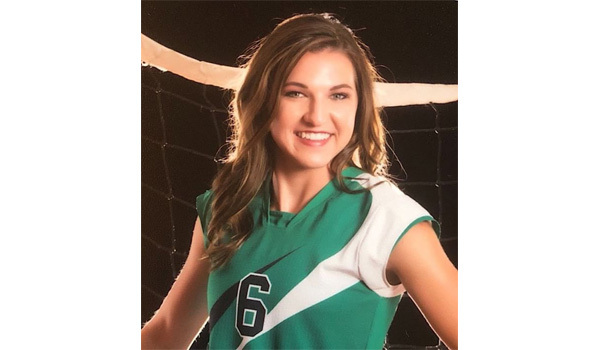 Paige Baird, 5-foot-8 senior of Northern Valley High School, is one of the top multiple sport athletes in Kansas, regardless of classification. She may also be the most accomplished high school athlete in the state of Kansas in multiple sports. Although Almena, where Northern Valley High School is located, has just 408 people, it doesn’t stop Baird from being one of the state’s best. And Baird doesn’t even live in Almena, she lives in nearby Long Island, Kansas, population 134. Her name comes up at Sports in Kansas in every season, we really noticed that in track and field a few seasons ago but that may be her third best sport and we will get to that in a bit. In volleyball, an outside hitter and setter, she’s an all-state selection for the 1A state champion Huskies (32-9 in 2017) a year ago and that’s where she may shine at the next level. She also plays competitive club level volleyball all across Kansas in the off-season, which for Baird there’s never an off-season. She was the 2017 1A Player of the Year, All-State Tournament Team and All-Academic Team. She is going for her fourth consecutive all-state season in 2018. Her team, which opened up the season this past weekend, has also been league champion the last three seasons. In basketball, she led all of 1A-II in scoring with 22.3 points per game. She was a first team all-state selection in 1A-II last season at Sports in Kansas and also earned the same honors as a sophomore in 2017 and second team honors as a freshman in 2016. She is also looking to become a four-time all-state selection in basketball this winter. She enters her senior season with 1,116 points in her career after being a finalist for the 1A-II Player of the Year. In track and field, she is a 12-time all-state selection out of the possible 12 events you can do, she very well could be a 16-time all-state selection by May of 2019. Baird has never finished worst than fourth place at a state track and field meet. She is a multiple time state champion winning four state titles in 1A over the last three seasons, three titles in the 400 meters and one in the 300 hurdles. She specializes in the sprints and hurdles. In fact, in 2017 as a sophomore, she won the 400 meters and 300 hurdles in 1A. So, what’s so special about that? Well anyone who runs or follows track and field is going… oh my. The two races are back to back and arguably two of the toughest three races to run in track. There are maybe two to three people a year at the state meet that even attempt to run the both in the same meet, Baird won them back-to-back at the state level as a sophomore. This past spring, she almost repeated that feat but came up just short taking second in the 300 hurdles but did defend her title in the 400 meters. Baird will be going for her fourth consecutive state title in the 400 meters this spring. Only two girls in the history of Kansas high school track and field have ever won the 400 meters all four years (Emily Bloss – Wellsville 1994-1997, Lauren Pickens – Peabody/Burns 2008-2011). Baird is also a model student at Northern Valley with a 3.98 GPA. Her favorite subject is Accounting, and she one day hopes to have a college business degree. Baird will play volleyball next season at Fort Hays State University where she may also decide to do track and field. For now, her focus is on her high school volleyball season where she plays for her mom, Northern Valley volleyball head coach, Kirsten Baird. Baird and her mother will look to add another state title this season after winning the 2017 1A-II title one year ago, however 1A is no longer two divisions, so Baird knows it won’t be easy. “We have a shot but 1A will be more difficult this season with only one division.” Baird said. Find out what makes this small-town student athlete special in the latest Q&A edition of Faces in Kansas below. This feature is presnted by All-American Glass, Auto Glass Repair & Replacment, located in Long Island, Kansas. Fast Free Mobile Service. Toll Free 866-312-2257. Ingrim Farms is also a proud supporter of Northern Valley Athletics and proud to support Paige Baird. Best of luck in 2018-2019. "When I first learned of Baird I believe I was on the Cox TV statewide broadcast at the state meet interviewing her a few years ago. Then again got to see her accomplish the feat of winning the 400 meters followed by the 300-hurdles back to back. That gives you all you need to know of what type of competitor that she is. Not only is she a top of the line mutiple sport athlete, she is a model student. It doesn't matter what size of school or town you are from, if you're good we are going to find you at Sports in Kansas. Paige could easily specialize in volleyball and play club year round but she doesn't, she decides to dominate in all three sports. Love stories like this in small towns where she literally does everything in every sport. Expect a big year. I think I have to classify her as one of the top multiple sport athletes in the state, if not the top. She's never not earned an all-state honor in any sport shes done in her first three years of high school, to think about sounds almost made up. Very impressive. She seems like an outstanding young woman as well away from the playing field." My mom was the JH volleyball coach when I was growing up, and I would go to all the practices since kindergarten. I loved playing with the older girls and tried to keep up with them. My sister is only two years older and we would always play inside or outside it did not matter. Volleyball has always been my favorite sport. My goals this year is to win league, be a good leader, and also get back to State. Last year at State I received the Player of the Year in 1A DII. That was a big accomplishment for me and was the highlight of my year. I am a versatile player that can play all positions. I see the court well and make good decisions to earn a point. I have a decent vertical jump which makes me able to hit it. This summer I have been working on my topspin jump serve. What’s the atmosphere like to play sports in your town? We have so much support with the girls winning state volleyball and the boys winning state basketball last year. Our small community is very supportive, and the younger kids look up to us. Brianna Sammons plays opposite of me, so we work together setting and hitting. Jasmine Covington and Jaden Smith pay middle. Zoe Cox, Sydney Brands, and Makenna Hammond are defensive specialists, and help setting when needed. We have a great senior core and great leadership on our team this year with seven seniors. Favorite thing about volleyball and sports in general? I have always loved to go out and compete. All of my friends and family are so encouraging. I work hard and hitting the ball for a kill is a great feeling. What’s it like to be a multiple sport athlete? I have always participated in all three sports throughout my life. In High school it is a challenge for me during basketball season when I have club volleyball. The late nights of driving, and the early morning matches are tiring, but definitely worth it. Both of my parents were athletic, so somethings come naturally for me. But it takes a lot of endurance to push through and excel. I have had one volleyball coach throughout junior high and high school, and that is my mom. She pushes me physically and mentally to be the best player I can be. I definitely get my competitiveness from her. What did you and the team do in the off-season to become better and plans to get better this summer? I lifted weights and went to multiple summer camps. I also competed in the Sunflower State games and played summer league with my HS team. I enjoyed the college camps the most because scrimmaging with the college girls was faster paced. I’ve had many offers for volleyball, basketball, and track. I am planning to further my career at FHSU majoring in business and playing volleyball and possibly track. I love going to the lake with my family, and spending time with my friends. I hope to have a business degree and have a good job someday. Also, to be married and starting a family. This year my favorite class is Accounting. My teacher, Mrs. Amy McKinney, makes it enjoyable yet informational. She pushes her students to be the best and always cared about us. My GPA is a 3.98, I am in the top third of my class. I would have to say my role model is my sister, Brooke. I have always looked up to her since I was little. It all started in gymnastics when she got a back handspring before me, and I was determined to do the same. She is positive and always has a great attitude no matter the circumstances. The Hammond Hut is the best place to eat in Long Island. It’s a great place to visit with friends and family. We are very lucky to have the Hut in such a small town! I eat ice cream almost every day after practice!